A Blues in Bb from Saxophone Colossus , recorded 1956. Finally, “Blue 7” is a blues, over eleven minutes long. Its main, rather disjunct melody was spontaneously composed. The performance is among Rollins’ most acclaimed, and is the subject of an article by Gunther Schuller entitled “Sonny Rollins and the Challenge of Thematic Improvisation”. 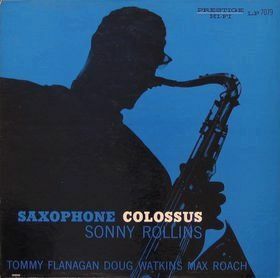 Schuller praises Rollins on “Blue 7” for the use of motivic development exploring and developing melodic themes throughout his three solos, so that the piece is unified, rather than being composed of unrelated ideas. Rollins also improvises using ideas and variations from the melody, which is based on the tritone interval, and strongly suggests bitonality (the melody by itself is harmonically ambiguous, simultaneously suggesting the keys of Bb and E). Also notable is Max Roach‘s solo, which uses a triplet rhythm figure later imitated by Rollins, again helping to give the piece a coherent feel.